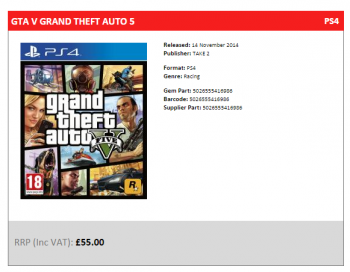 Take Two's official UK distributor, Exertis Gem, briefly showed a "November 14" release date for the next-gen version of GTA V.
Despite rumors that GTA V's PC version had been cancelled, Take Two insists that both the PC and next-gen versions of the game are still proceeding as planned, though they did neglect to offer anything more solid than the "fall, 2014" release date. Now, Exertis Gem, Take Two's official UK distributor may have just spilled the beans on the game's release date, briefly listing the PC, PS4 and Xbox One versions of the game on its official website as having a November 14 release date. November 14 certainly falls under Take Two's official "Fall, 2014" release window, and to add further legitimacy to the date, an Australian retailer reportedly issued a leaflet stating the game would release in November. Since the date was posted on NeoGAF, the Exertis Gem listing has changed back to "TBC". November 14 is also a Friday, and games in the UK are typically released on Fridays. That's pretty much all we have to go on for this one, so take it with as much or as little salt as you please. We have, of course, contacted Rockstar and Take Two, but we're not really expecting anything solid from them.